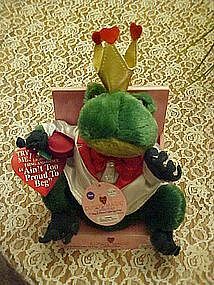 This cute little plush frog sings "Ain't too proud to beg" when you squeeze his hand. His little rose lights up and the frog bops up side to side as he sings. He is 7" tall plus the crown. Made by Cupid's Magic.